When Florence Nightingale wrote these words in 1859 it was to exhort nurses to give their best to the work they had chosen, despite the current jargons concerning rights of women. Today the word ‘jargon’ appears to have taken on a somewhat different meaning and is commonly understood as referring to a way of speaking, using words or terms peculiar to a particular group or profession. A first glance at nursing models may seem to reveal an overabundance of such jargon, and we as today’s nurses are being exhorted to give our best to our chosen work by using a particular model of nursing in our area of practice. The model to be discussed in this book was designed by and for British nurses, so for them the problem of unfamiliar terms is minimal. One aim of this chapter, however, is to help nurses who may be unfamiliar with nursing models to negotiate a way safely through the common terminology of models, to emerge unscathed and eager to continue. 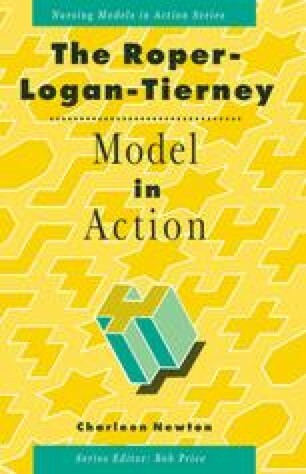 The chapter will look at the development of nursing models in general and at the Roper-Logan-Tierney model in particular; it will discuss what is meant by the term ‘nursing model’; it will examine the way nursing models are constructed; and it will explain the terms used to describe them. Finally we shall think about some of the reasons why nursing models are used. Oh, leave the jargons, and go your way straight to … work, in simplicity and singleness of heart.